Tasmanian Helicopters have invested heavily into specialised equipment and skills specifically for the electrical transmission industry and it is now a major part of our business operations. We understand the importance of reliability when it comes to critical infrastructure and this is why we operate all of our own equipment to ensure you can maintain your infrastructure to the highest operational standards. 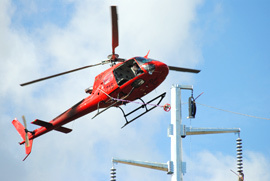 The precision and versatility of helicopters makes them an ideal and efficient choice for the stringing of powerlines, particularly in remote or difficult to access areas. We utilise our own Mack-Pull Line Haulage System, which has been specifically designed to make the stringing of powerline draw wire or conductors fast and easy. A major advantage of the Mack-Pull system is it is mounted on the side of the Squirrel and does not require a large external weight between the helicopter and the draw line, which provides for a reduced operational weight and subsequent increased power margin available to the pilot. Using the state-of-the-art Javelin Water Lance we are able to undertake high volume washing of assets in a safe and efficient manner. The Javelin is mounted in the rear of the helicopter cabin and operated by either the pilot in command or a crew member. The Javelin is environmentally friendly, it utilises a low 50 litres per minute at the high pressure of 2,000 psi. This ensures a quality job. The capacity of the water tank is 500 litres, which results in increased efficiency by reducing the requirement to continuously stop and refill. Being proactive by undertaking routine aerial inspections and implementing preventative maintenance programs reduces life cycle costing and improves distribution reliability, all critical factors in maintaining electrical transmission infrastructure. We operate our own Line Access Platform, which is ideal for both inspection and maintenance activities. The platform is able to safely and comfortably seat 2 line workers during inspection, maintenance and peak transfer operations. The Line Access Platform can be installed on either side of the helicopter and may be stored in the helicopter cabin for ease of transport and rapid deployment. Utilising helicopters for lifting and placement or removal of towers and other infrastructure reduces the reliance on major civil works required for site access and subsequently reduces capital construction and maintenance costs. Six of our seven helicopters are suitable for lifting operations. We are able to lift up to a maximum mass of 1,050kg, which is ideal for any precision placement of transmission tower components. 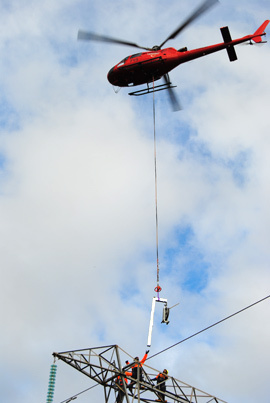 If you require greater lifting capacity we can source a helicopter to suit. Our range of helicopters provides clients with a range of affordable options to suit your individual lifting needs.